In blender or food processor, place strawberries. Cover; blend on high speed until smooth, stopping to scrape down side. In medium bowl, stir together orange juice and yogurt. Stir in strawberry puree until blended. 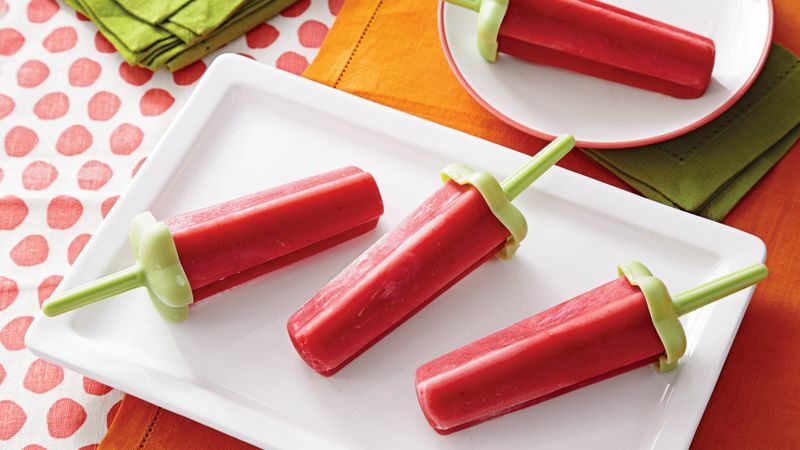 Divide mixture evenly among 12 (3-oz) ice pop molds or 3-oz paper cups. Cover with mold tops or cover with foil and insert half-craft stick in center of each pop. Freeze 8 hours. To serve, remove pops from molds or peel off paper cups. Cut limes in half; hollow out pulp, leaving peels intact. Spoon strawberry-orange mixture into lime halves; sprinkle with miniature chocolate chips. Freeze 8 hours. Cut frozen lime halves in half again to look like watermelon wedges. To Freeze: Keep pops frozen up to 3 months.